AUDEMARS PIGUET REF. 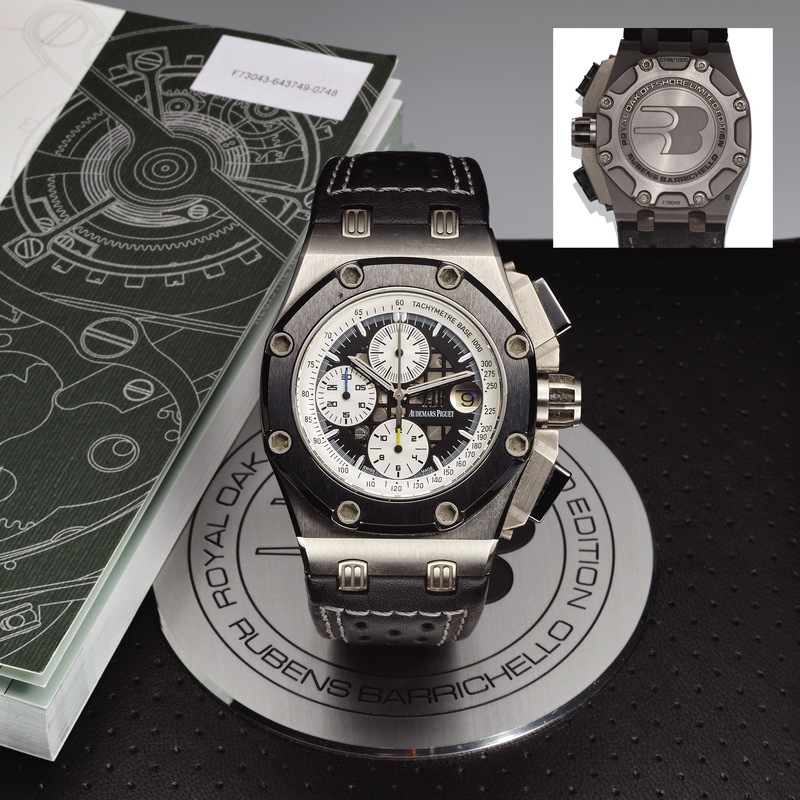 26078 ROYAL OAK OFFSHORE RUBENS BARRICHELLO TITANIUM Audemars Piguet, "Royal Oak Offshore, Limited Edition, Rubens Barrichello," No. 0748/1000, case No. F73043, Ref. 26078.1O. Made in a limited edition of 1000 pieces in titanium in 2006. Very fine and very rare, oversized, octagonal, self-winding, water-resistant, titanium and ceramic wristwatch with date, square button chronograph, registers, tachometer and an Audemars Piguet titanium deployant clasp. Accompanied by the original fitted box, certificate of warranty and instruction booklet. Three-body, polished and brushed, case back and bezel secured witHEIGHT hexagonal screws, ultra- resistant ant shock technical ceramics for the bezel, pushbuttons and crown, side profile of the bezel mimicking the ventilations on a brake disc's edges, screw-down crown inspired by a gear wheel and push buttons inspired by brake cooling ducts, case back with special Rubens Barrichello logo, sapphire crystal. Bicolor black and silver with applied luminous baton indexes, outer 1/5th seconds track and tachometer scale on a silver reserve, the center pierced with a racing motif to reveal the movement, subsidiary dials for the seconds, the 12-hour and 30-minute registers, cyclops aperture for the date. Luminous steel stylized baton hands. Cal. 2326/ 2840, rhodium-plated, fausses cotes decoration, 54 jewels, straight-line lever escapement, monometallic balance adjusted to heat, cold, isochronism and 5 positions, shock absorber, self-compensating flat balance spring, 21K gold rotor. C. Three-body, polished and brushed, case back and bezel secured witHEIGHT hexagonal screws, ultra- resistant ant shock technical ceramics for the bezel, pushbuttons and crown, side profile of the bezel mimicking the ventilations on a brake disc's edges, screw-down crown inspired by a gear wheel and push buttons inspired by brake cooling ducts, case back with special Rubens Barrichello logo, sapphire crystal. D. Bicolor black and silver with applied luminous baton indexes, outer 1/5th seconds track and tachometer scale on a silver reserve, the center pierced with a racing motif to reveal the movement, subsidiary dials for the seconds, the 12-hour and 30-minute registers, cyclops aperture for the date. Luminous steel stylized baton hands. M. Cal. 2326/ 2840, rhodium-plated, fausses cotes decoration, 54 jewels, straight-line lever escapement, monometallic balance adjusted to heat, cold, isochronism and 5 positions, shock absorber, self-compensating flat balance spring, 21K gold rotor. Dial, case and movement signed. DIAM. Bezel 42 mm. THICKNESS 15 mm.